Is your engine burning oil or lacking in performance? Do you need new piston rings for your reconditioned engine? Honing the engine bores is a vital process of reconditioning most engines. The engine block houses many important parts like the piston rings, cylinder heads, intake and exhaust passages. Therefore, it’s vital each bore can handle compression stress, maintain correct oil flow and reduce the production of harmful emissions. ARA Engine can improve the efficiency of your engine. We provide engine block honing to improve engine performance, reduce tension stress, and increase the lifespan of the engine. ARA Engine uses the latest machinery to hone a range of engine blocks. 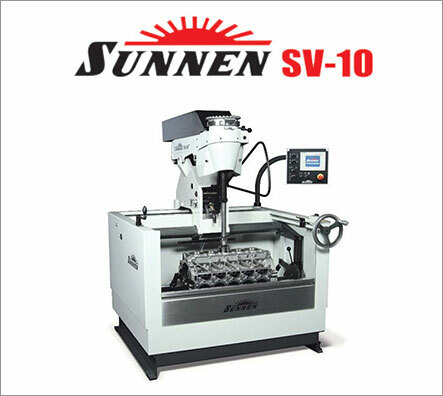 The Sunnen SV-10 Vertical Honing machine uses diamond stones to finish cylinder walls to the correct finish. With a real-time display and touch screen control, we find inconsistencies where the bore is visually smaller. The variable independent spindle and crosshatch angle calculator allows us to produce crosshatches of any angle. With just the right amount of surface roughness, the bore will allow for correct oil retention and lubrication. Most importantly? You won’t blow any more blue smoke. ARA Engine is an engine reconditioning and maintenance service provider. Our engine reconditioning services restore the performance of many engine types, while extending their life and giving you a smoother drive. With the latest in-house machinery, our automated solutions reduce human-error and allow us to hone engine blocks with an unprecedented level of precision. All machinery is operated by licensed professionals with years of experience. Our team receives up-to-date training on the latest industry practices and testing on proven engine reconditioning techniques. Each honing job is overseen by experienced site managers, tested and check-listed to maintain the highest level of quality control. With the advent of Automatic Honing technology, honing an engine block can be done quicker, cheaper and more efficiently than ever. This means the savings can be passed onto you. By saving on service costs, you’ll enjoy a smoother and longer lasting ride at a very reasonable cost. Call (02) 9892 1033 or message an engine reconditioning expert to learn about the performance-enhancing benefits of engine block honing. The Sunnen SV-10 Vertical Honing machine uses diamond stones to precisely finish cylinder walls to the correct finish and with extreme accuracy. The importance of perfectly round, taper free cylinders is critical to the longer of any engine technology allows us to machine cylinders to the highest possible standards.